280 Ohio Archaeological and Historical Quarterly. By the House of Delegates, December 15, 1778. J. DUCKETT, C. H. D.
By the Senate, December 15, 1778. THE VIRGINIA REMONSTRANCE OF DECEMBER 14, 1779. 282 Ohio Archaeological and Historical Quarterly. The onus was now shifted from Maryland to Virginia. This remonstrance is in defense of her position. IN GENERAL ASSEMBLY, THE 14TH DECEMBER, 1779. AMERICAN STATES IN CONGRESS ASSEMBLED. to erect a separate government within the territory thereof. cess of time must degenerate into an intolerable despotism. fined in the act which formed her new government. warranted by the articles of the confederation. BENJ. HARRISON, Sp. H. D.
Attest: JOHN BECKLEY, C. H. D.
THE CONNECTICUT CESSION OF OCTOBER 1O, 1780. 288 Ohio Archaeological and Historical Quarterly. United States until further order from this Assembly. exception of the Western Reserve. BY REV. C. E. DICKINSON. ants, provided they obeyed the divine precepts. ing, were in the pulpit and took part in the exercises. 290 Ohio Archaeological and Historical Quarterly. banner and say with honest pride, " I am an American." hand of a mummy where it may have lain for 4,000 years. fold, and it has since multiplied itself from year to year. the rocks it scattered its seed until it overran the empire. without a bishop was a State without a king. and deep the foundations of the church and the school. it was "Resolved, that a committee composed of Rev. 292 Ohio Archaeological and Historical Quarterly. the sums respectively annexed to our names. Dated March, 1788." but probably to the fund above mentioned. 294 Ohio Archaeological and Historical Quarterly. Christian institutions in the Ohio Valley. which had been prepared for a Fourth of July banquet. pleasing, though somewhat unusual, sight for us to see. was much pleased with the whole exercises." their congregations. All this is the growth of a century. one family had then arrived at Marietta. Sundays, and the fifth was probably not an exception. He left for his home August 18, and the next day Rev. firmly rooted and grow up to full maturity." with a view to entering the ministry. Dr. Cutler: "I beg you will come on as soon as possible. 296 Ohio Archaeological and Historical Quarterly. firm my wife in her faith I have sent it for her perusal." vember 23, 1788, we read, "Heard a sermon by Dr.
27, the weeping parents laid the little body in the grave. buried the body in a coffin of cherry wood, which, at Dr.
somewhat from that primitive simplicity. struction given him Dr. Cutler secured the services of Mr.
could have his board and $5.00 per week here and constant employment. 298 Ohio Archaeological and Historical Quarterly. men were not church members. or labor what is affixed to our respective names." home church under such circumstances. pline fitted to a church to be erected in a new plantation." 300 Ohio Archaeological and Historical Quarterly. cannot tell, but they did not adopt the office of ruling elder. former membership." Several members were so received. to share in its worship and participate in the sacraments. concur therein, and make provision for their support." sixty days later, an affirmative answer was received. agent for and in behalf of this church, to join with Mr.
matters necessary for having the said ordination effected." In accordance with this vote, a council was called by Dr.
Massachusetts, August 15, 1798, at which time " Mr.
302 Ohio Archaeological and Historical Quarterly. churches during the next half century. 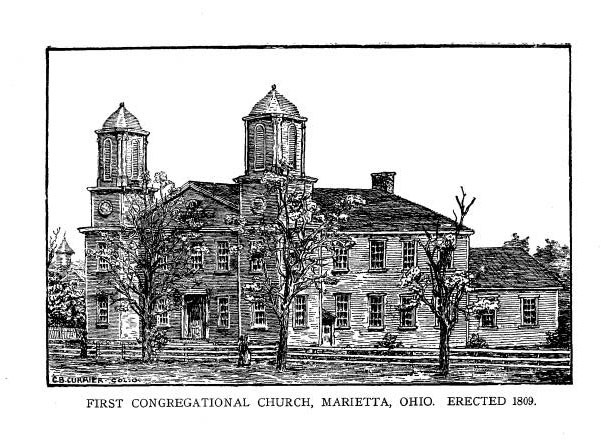 tion at Marietta and its vicinity. council then went in regular procession to the meeting-house where the Rev. cluded the solemnities with an address to the throne of grace." ber 30 of the same year at the age of forty-nine. were strongly attached to him and his influence was good. on guard during the Indian war. of the church. This society made a contract with Mr.
lands. The leading members of the society now hoped. minister to preach for them. In the interest of peace, Mr.
church. That church was discontinued after a few years. ents to the present time. Mrs. Mary (Bird) Lake, wife of Archibald Lake. Mrs.
her family to a farm about eight miles up the Muskingum. with an enrollment of not less than 2,000,000.
in aid of Presbyterian than of Congregational churches. he received about twenty members on confession of faith. class for literature and science as well as popular talent." the second pastor of this church. and the world, and this influence is steadily increasing.